Something was eating the young wisteria, but we couldn't spot the culprit, until today. A large, freshly moulted Vapourer Moth caterpillar, also known as Rusty Tussock moth, Orgyia antiqua. Their odd arrangement of hairs and tufts, with neat 'shaving brushes' on their back and tail, and four feathery tufts on a grey-black and red background make it look strange indeed. And if the caterpillar is strange, the adults no less so. Adult male Vapourers are pretty day flying moths, russet coloured with a white spot on each forewing and large feathery antennae. In contrast, females are large, slow moving and flightless as they only have vestigial wings. They don't move far from their cocoon during their short lives, commonly laying their eggs on the cocoon itself. 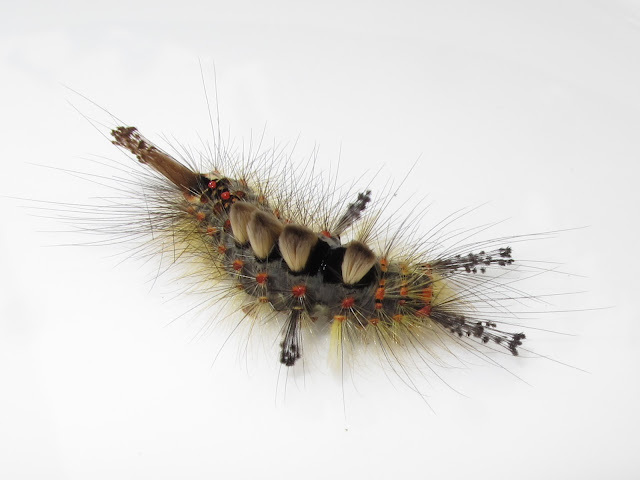 The adults do not feed, but the caterpillars are generalist feeders and use a wide range of bushes, and compensate for their mothers immobility by dispersing widely. I have seen the caterpillars from June to August. After her white bowl treatment, this one was moved to the large cotoneaster, where I have seen them before. Amazing and as usual, absolutely fascinating. We've learnt so much from your blog. We're surrounded by such overlooked beauty. Thank you for uploading. We'll check out the catoneaster tomorrow! Thank you so much for your kind words. We are learning together! I found one in east Texas USA the other day. I got in the car and found it on my neck. I was amazed by it, especially the four tufts on it's back. I released him on a leafy bush after taking a couple of pics. Thanks for the blog. I have dozens of this caterpillar destroying my roses but so far have resisted the temptation to destroy them. Thank you for your comment Ellie. 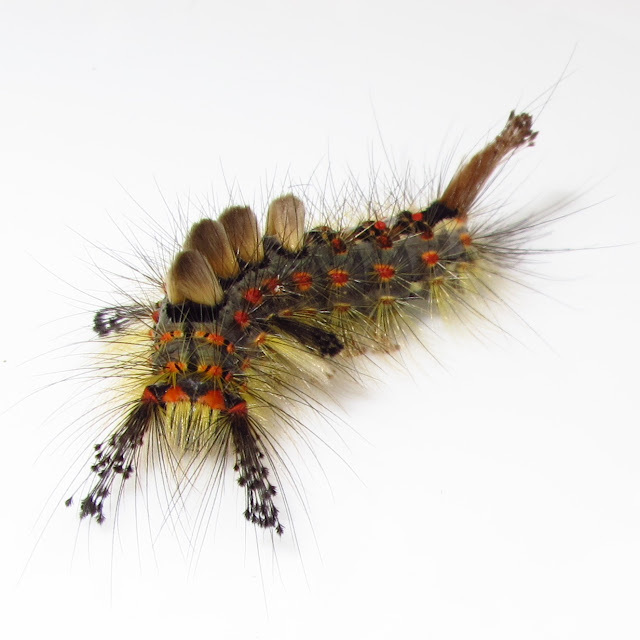 Nothing to worry about, often caterpillars are nocturnal, especially moth caterpillars. They will do their eating at night, and rest in a leaf all day. Thank you Graysing for you comment and great you found one, nothing like seeing the real caterpillar to truly appreciate it. Thank you for your beautiful photos. I found one of these on a bedsheet which had been on the washing line near fruit trees where we live in SW England, UK. It was so fairy-like and beautiful it hardly looked like a caterpillar. Even my son (who is used to exotic-looking insects having grown up in the Cape) was delighted. Our neighbour identified it as the Vapourer Moth. It's back in the garden now munching to its heart's content and I can send your link to our old friends in the Cape. Thank you.